This is the first neighbourhood guide for my favourite locations in Lima and it’s all about the tourist friendly, foodie district of Miraflores. There are so many amazing places to see here, so the list is pretty long. However, there are always places for me to add as new places pop up, so don’t forget to check back! This guide partners with my list on Google Maps, ‘Distrcit Edit – Miraflores’ and it just explains my choices in slightly more detail and shares any extra information I may have written previously. Links for the different locations are available through the map. I hope this helps give you some inspiration for your next trip to Miraflores! This is not technically a specifically Peruvian dessert, however you won’t find a pasteleria here in Lima without their version of chocolate cake. Also, you might have heard that cacao here is a big deal so, you know, it’s only fair to include the cake in my list of Peruvian desserts. Oh, and I love chocolate cake. Are you, like me, one of those people that always has hope at any parties or weddings that you attend that the cake is going to be a chocolate one? Yeah, thought so. Chocolate cake here in Peru comes in many forms. From a two or three layer dense and sticky cake to a one layer chocolate packed wonder. From a manjar blanco-y (that is a word btw), fudgy icing, to a simple chocolate ganache. And just about everything in between. Oh yes, everything. On the bad side, I’ve eaten chocolate cake that just tasted of cake….no chocolate, just cake. On the positive, some bakeries like to twist it up a notch adding truffles, liqueurs, and other fancy items, which do not often disappoint. However, I have decided that for my recommendations I want to focus on the old favourite of chocolate cake + icing. Now in my search for said perfect cake, I have found that there were certain criteria. My birthday is my favourite day of the year aside from Christmas. I get to choose everything we do for the day and no one can tell me off for eating cake for breakfast, lunch and dinner…. Suspiro de Limeña (or Limeño, or without the ‘de’, or with ‘a la’ instead of ‘de’, etc …..) literally translates as ‘sigh of a Limeña’, (Limeña meaning a woman from Lima). I’m not sure where the name comes from but I think it’s quite beautiful and original! The dessert is made up of two parts. The top is a soft meringue (think Italian meringue) flavoured delicately with port, and the bottom is a base of manjar blanco (a caramel made from milk and sugar) mixed with egg yolks, sugar, and vanilla. It is a very sweet dessert. No joke. I actually really, really love the soft, fluffy meringue that sits on the top. It is definitely my favourite part and I probably could just eat a bowl of that. Isn’t it amazing what egg whites become when they are whisked, with a little sugar, to within an inch of their lives! The dessert in general is scrumptious, but I am super fussy with the particular ones that I will eat. Although, essentially, this dessert is made from milk, I do not much like the taste of it, and therefore do not like tasting milk in my desserts. In addition to this, a shortcut to make manjar blanco is to boil condensed milk until it becomes manjar, but the taste of condensed milk is a million times worse than regular milk. For me, a good manjar blanco shouldn’t taste like condensed milk, and therefore neither should any dessert with it in. Therefore, I am always super happy when I find a suspiro that fits the bill! Here is a list of some of the best in the city that I have tasted so far, but I’m sure there are many more yet to be tested! Where would I recommend in Lima to eat Suspiro de Limeña? Sunday lunches are my kind of lunches. Long, lazy and with a lot of food. And at The Marriott, ‘a lot of food’ is just what they’re offering. The Marriott Hotel is situated just behind the Malecon (the path that follows the clifftop) and Larcomar shopping centre in Miraflores, and their restaurant ‘La Vista’ has beautiful views of the ocean in front of it. La Vista has 4 types of buffet throughout the week; breakfast, lunch, afternoon tea (amazing) and a Sunday lunch buffet. Sundays are days for relaxing. Days for Skype-ing. For eating. For drinking. And then later, for lying in bed with Netflix. I love Sundays. And I love Tanta. Tanta is one of Gaston Acurio’s restaurant chains, with a few branches within Lima and Peru, and then the rest dotted across the globe, even as far afield as Barcelona. For those who may not know, Gaston is an ambassador for Peruvian cuisine and has helped to promote it, alongside other chefs, all over the world. He has been a big influence in Peru gaining worldwide accolades for their incredible food scene, both in the restaurants and the raw ingredients that are produced here. Tanta serves typical, traditional Peruvian (or Peruvian fusion) cuisine, but often in a modern way. However, just because Tanta was started by Gaston and is very fresh and modern, does not mean the restaurant is overly fancy or expensive. The dishes here are not tiny morsels in the middle of large plates, which is obviously perfect for me, and the prices are so reasonable (main dishes are between S/25 and S/50). Due to the fact that it is summer in Lima, restaurants are normally fairly empty as everyone heads to the nearby beaches. However, arriving at 2pm, we found Tanta its normal, popular, busy self. And at last we arrive at the dessert namesake of this blog. Pie de Limon, or Lemon Meringue Pie, is a favourite in about a bazillion countries. (Bazillion = a lot x 1000….. approximately…..maybe). Pie de Limon consists of 3 layers. A base made from crushed biscuits and butter, although pastry is used instead equally as much; a layer of a smooth, sweet, but tangy, lemon curd-y filling; and finally a fluffy meringue topping, usually toasted on top with a blowtorch perhaps or popped briefly in the oven. I do have to point out briefly that in the UK, and other countries too, they make the pie with lemons (kind of obvious, no? ), but here in Peru they make it with limon. Limon is a small citrus fruit with it’s closest comparison being a Key Lime. The taste is slightly different, but to be honest it’s not a giant leap away. Pie de Limon is super tasty if you make it correctly and that means all 3 layers of equal tastiness. In my pie vision, for example, I hate a crispy meringue or a lemon layer that tastes too much of condensed milk. I’m not sure why condensed milk is often used as an ingredient here in Peru for this part of the pie, I’m pretty sure lemon curd does not include condensed milk. Actually I’m convinced it does not include condensed milk. Please stop this madness. Also, I would always recommend having a slice cut from a larger pie as opposed to individual tartlets. The filling to base ratio is much better in a slice and you usually get a whole heap more of meringue. I’ve tried a few individual ones here in Lima and none have been as satisfying as a giant slice. A good Pie de Limon is a happy thing. Tres Leches literally translates as three milks, and the milks that it refers to is condensed milk, evaporated milk and crema de leche. Don’t worry it’s not some kind of milky, flan-type panacotta monstrosity, the dessert is actually a light sponge cake soaked in the three milks and sometimes topped partly or completely with soft meringue. Now that sounds so much better, don’t you think?! Also, it normally comes served with all the excess sweet milky mixture, so no mouthful should ever be dry at all. This dessert is heavenly and very rich, especially if you like big fat slices like I do. Coming from the person least likely to drink/eat anything milk related, you know this cake must be awesome. Where would I recommend in Lima to try it? 1. Maga…mis suspiros. It costs s/8.50 a slice and it’s so worth it (did I just sound like a shampoo advert?). It’s a good hearty slice, with an amazing flavour and comes topped with little dots of soft meringue (this is the one pictured above). Happy days! It’s probably good to share a slice like this but to be honest you could be selfish and polish this off all by yourself. This is a very popular place to come for tres leches, along with all of her other desserts on sale. It is a small shop but there are a few tables to sit in and eat, otherwise you can take away and enjoy in the comfort of your living room in your pyjamas. 2. La Bodega de la Trattoría (started by Sandra Plevisani). I tried her Cinco Leches (Five Leches) at Mistura 2013 (Peru’s main food festival) for less than s/7 and I was incredibly lucky. Topped with a soft meringue and served with strawberries, this is some of the best ‘Tres’ Leches I have ever eaten, and don’t just take my word for it. According to El Comercio she sold 10,600 portions of this in just one day at Mistura last year! You can try it too but you will have to pay s/22 in her restaurant for the pleasure. (I have not tried it here but I can only assume it’s just as good!) Honestly, you will not regret paying the money for it once you eat it, but you will regret it if you leave without trying it!! P.S. Do you want to know what the other ‘leches’ were that made this particular dessert up to a Cinco Leches? They were leche de coco (coconut milk) and manjar blanco (basically condensed milk boiled in the can). The Cinco Leches is also available at her other restaurant La Trattoría di Mambrino. 3. La Heladeria. Technically you do have to travel outside of Lima city to find this, but the beach town of Punta Hermosa is only about 25-30 minutes away and seeing as summer is approaching, you will be much more likely to find yourself heading out in this direction. This small cafe sells artesanal ice cream, desserts, juices and more, and obviously I have tried more than a couple of the desserts here. The Tres Leches at La Heladeria is sublime. Smooth, creamy and sweet. There is barely a taste of milk, which suits me perfectly, and it is finished with shavings of chocolate. 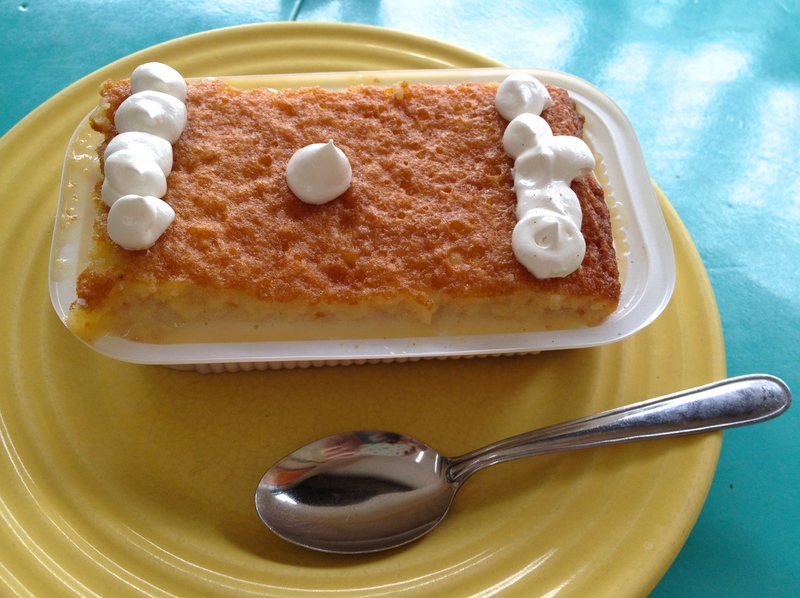 This is absolutely one of the best Tres Leches I have eaten in Peru.